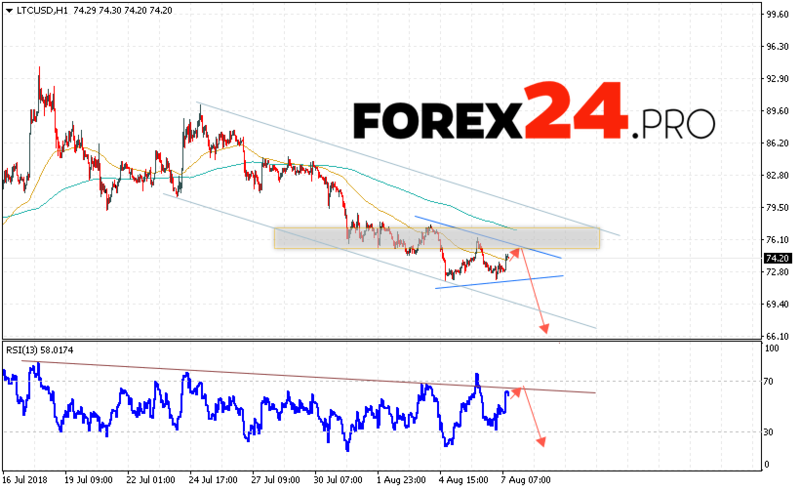 Litecoin LTC/USD are trading at 74.20 and continue to move in a bearish trend. At this point, we should expect an attempt to test the resistance level near the area of ​​76.00. Where again we should expect a rebound and the continued decline of the Litecoin exchange rate with a target below 65.00. In favor of the decline in LTC/USD quotations, a trend line test will be performed on the indicator of relative strength index (RSI). The abolition of the fall option will be a strong growth and breakdown of the area of ​​80.00, which will indicate the breakdown of the resistance area and the continued growth of the rate of the cryptocurrency. With the breakdown of the lower bound of the «Triangle» model and the closing of quotations below the level of 70.00, we should expect confirmation of the development of the bearish trend for Litecoin. Litecoin (LTC/USD) technical analysis August 8, 2018 suggests a test of the resistance area near the level of 76.00, from which it is expected to rebound and continue falling of LTC/USD in the area below the level of 65.00, an additional signal in favor of Litecoin decline will be a trend line test on the indicator of relative strength index (RSI), the abolition of the fall option will be a strong growth and breakdown of the area of ​​80.00.